Grab your gear blogging buddies and head on over to KindergartenWorks for a fun giveaway! Just click the image below and you will be on your way! 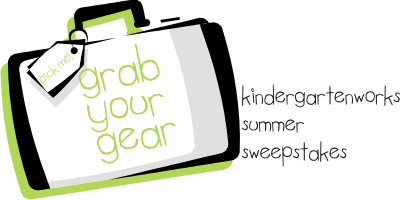 KindergartenWorks: grab your gear: "Whether you're packing up the family this summer or just doing a little blog stalking for planning purposes KindergartenWorks wants to make ..."
Thanks for sharing Janine! Hey, could you try something for me? I've embedded new comments on my blog but now people's clickable links aren't showing up like normal. Would you be willing to post another comment (you could get an extra entry in the giveaway for it!) and try just typing in your blogs address in a different way. Your took me to a page that didn't exist, and I want to be sure that bloghoppers find you! Thanks!